Well folks, it's all finally over. We've played our hearts out and given our all until our fingers were sore. We've ranted, we've raved, we've gotten stuck a couple times but we have finally reached the end. Team Living and Team Dead were the teams competing for this years Games Master Challenge. Teams for Magax (Living) and Hubrid Nox (Dead) battled it out to see who would win the November 2017 Games Master Challenge. It was a close battle in the beginning with Team Dead leading 51 to 49, on the last day it was tied 50-50 but only one team could be the true winners of the Challenge. Team Living came out on top with 51 over Team Dead’s 49. I’m sure you can all relate to Imiya - she has a big math exam tomorrow and she can not get it off of her mind! We have all been there. This math trouble has even begun to haunt her dreams, which is troublesome because she is going to need as much sleep as she can get. In Imiya’s nightmare, aggressive Babaas are pestering her for the answers to math problems. If the problems are not solved in time, those Babaas will fall right out of her dream and onto her alarm clock. That alarm will wake her up, resulting in even less sleep for poor Imiya and math exams never go well with a bad night’s sleep. If you’ve ever stepped foot into the NeoBoards, you already know it is a daunting place with cliques galore, It’s like walking into high school in the second year, everybody already knows each other and every has their friend group and you feel too weird to even try because what if everyone just disregards your messages? So you hastily exit the Neoboards and run off to play feed Florg by yourself. Aid came to Faerieland from all corners of Neopia in her time of need, and often in curious forms. Queen Fyora and General Aethia had been quite clear in their warning: that there shouldn't be a single soul in Neopia that isn't preparing for war. All sorts of groups had pledged fealty to the Faerie cause, from the Defenders to the Order to the Seekers. 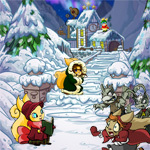 And thanks to his connection to the Seekers, a Christmas Kacheek named Jacob was among those aiding the war effort. Professor Lambert, the head of the Seekers, addressed his organization's volunteers, having received instructions from Aethia herself. "Ladies and gentlemen, our time is once again at hand," he said, raising his pointer finger skyward for emphasis. "A loss for Faerieland is a loss for all of Neopia, so we must fight back the Wraith menace. We must have answers! However, the answers we seek can only be obtained in one way." Professor Lambert twirled his parasol before taking a fencing stance with it, lunging forward before regaining his previous posture. "One on one armed combat." After a tangible silence from the crowd, the Gnorbu cleared his throat and adjusted his spectacles. "Now then, General Aethia has given us access to the armory, and has been generous enough to offer each of our troops a Corrosive Spear Wand. This weapon should provide just enough power to take down the Snapjaw Wraith that have been plaguing the area as of late." I was walking down the corridor when I heard something. I turned around and saw no one there. Before I go too much further, I'd better tell you who I am and what I'm doing here. My name is Clair, I am a Lutari and I live in The Haunted Woods. I was on a school field trip to the Deserted Fairground with my classmates. As I turned back around to keep looking through the little haunted house that was part of our tour, something was telling me to turn back and return to the rest of my class mates, but I turned around anyway. I should have listened to the feeling telling me to go back to the others, because as soon as I turned I saw what looked like a ghost. Screaming, I ran to tell the others, but naturally, no one believed me. When we got back to school, I was as white as a ghost, and when people asked me what happened, I told them and they didn’t believe me, yet again. After school was finished, I decided to go back to the haunted house and try and get proof. I walked towards the entrance and tried opening the door. I got a massive shock when the door slowly opened by itself. As I inched in further, things turned weird, lights were already getting turned on and it sounded like others were walking down the hallway, so I went to investigate. There was no one there, so I started drawing in my notebook that I had brought along, this house was very cool and I wanted proof that I had been here and had seen the ghosts. Rupert stumbled on the shaky bridge that stretched the gap between firm, sturdy land and the rocking boat. The boat sported a rainbow sail that Rupert could only hope would last the full journey, it seemed a bit lackluster compared to the grand warships he had read about in his books about seafarers. This seemed like a rickity replacement and again his nerves set in. But he knew he had to press on if he was going to make it to Mystery Island. And so he found a nice seat in the shade of the sail, and tucked his backpack underneath his seat and pulled out a book to read on the long journey. What Rupert did not realize is that the boat would rock so much. You see, when you are on an unstable piece of wood out in the wavy ocean, reading could cause you to feel quite nauseous. In fact, just about everything would cause you to feel quite nauseous. Rupert's head began to feel light and his stomach started to turn and turn as the boat pressed forward through the waves and further into the horizon. He looked back and saw the sight of land was dwindling and he started to become horrified. What have I done, he thought in panic. He realized there is no turning back now, no matter how much he wanted to. This boat is going to keep going and I have to keep going too. I have to keep it together...I have to keep it together...I have to keep my lunch in my stomach. But he continued to feel more and more queasy. "Ay boy, you're lookin' quite ill there," Rupert heard a voice ring out. I’m sure you can all relate to Imiya - she has a big math exam tomorrow and she can not get it off of her mind! Customization, the 8th wonder of Neopia!